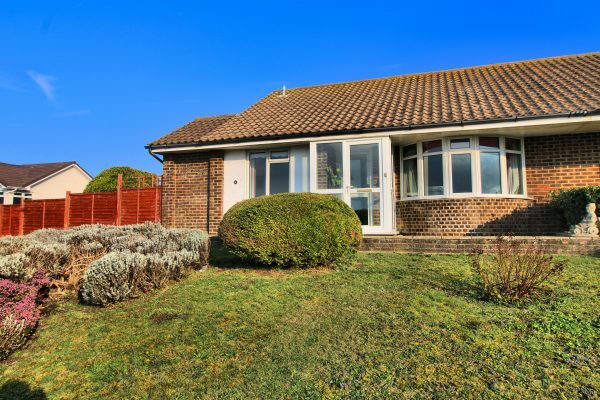 An opportunity to acquire a semi-detached two bedroom bungalow, situated in an enviable and elevated position, backing onto farmland. Superb views across rooftops towards Seaford Bay and to Newhaven can be enjoyed from the front elevation. The property has the benefit of a garage in an adjacent compound and an off road parking space to the side of the bungalow. The open plan front garden is a good size and adjoins a central pathway providing pedestrian access to other bungalows in the cul-de-sac. The accommodation, which requires some updating, comprises uPVC double glazed entrance porch, entrance hall, sitting room, conservatory, kitchen, two bedrooms, shower room and separate W.C.
Further benefits include double glazed windows and external doors, gas central heating and, of course, amazing views. Offered for sale with immediate vacant possession and no onward chain.